I still have my street portraits to share, but I am thinking about how to share them – and I also have not really had the time to go through them yet. However, I promise to have them sometime this month. In the meantime, because it is Monday, I thought we would join Restless Jo for a Monday walk around the Sunshine State – we will be driving for a few shots, but here are some misc. pictures I took on some of my walks in FL this year. A WALL of surfboards (from CORE’s surf shop)- linked to the wpc for wall this week. I know some folks would crop off that small part of the retaining wall, but I like it there. This is some ground up Kava root my younger sister and I tried (also called kava-kava). I have had Kava in Yogi tea and in some smoothies – so I thought I would give the powder a try. It was supposed to be relaxing, but it made me wide awake and It is a bit slimy — so I did not care for it. It reminded me of slippery elm. Anyhow, I found out that it is banned in some countries because it can be harmful to the liver (?) – I still have the bag of kava, but not sure if it is something I will ever consume again. Kava root is front eh South Pacific and it is used in religious ceremony. The cool burlap bag it came in has a tribal feel to it -so this is linked to Tribe at Lost in Translation with guest Guilhem. Rollins College is considered the Harvard of the South…. well to some folks it is considered this – but not to all. I did not get to visit their art musuem on this trip, but next year I will try and make it. From 1990 to 1992, I worked at a building that sat right under this tree in Winter Park, FL. It was old back then…. and it is even older now! There is something about this photo I just really like – maybe the verticals – or the light/splashy feel – or maybe I like this photo because I took it after only being in Florida for a few hours. I was happy to see my mom, the traveling was super easy, and it was fun to see revisit some old stomping ground. Have you ever heard that Florida is one big swamp? Back at home I arrived to doggie paws in the snow! -But as we all know, coming home after a trip is oh so sweet -even if you have to put boots back on the feet – coming home to family and to your own much loved bed – ahhhhh – maybe a bit tired, but all fresh in the head. A special thanks to Jill here and Restless Jo here for linking me up with the B & W challenge. Have a great day – and thanks for dropping by. well thanks for guessing – and no…. not white. March 17, 2015 at ..
thanks Norm – have a great week – and I took a photo of a door at the bank last week that I might be sharing with you on one of your Thursday Door challenges – it was such thick door! the egret is still my fav – but I do think of you with some flowers – funny how we bring our blogging friends with us at times…. I know… I soon will find wildflowers, can’t wait! Glad you like the egret! Wonderful photos as always Yvette! My favorites were the Wall of Surf Boards and that street shot of a rainy day in Florida. There is something about railroads that always draw me in. 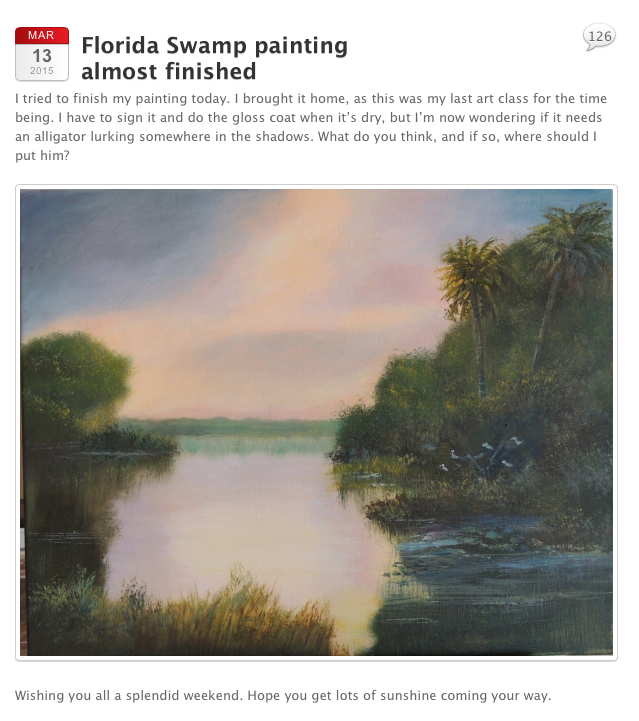 I also love Sylvia’s amazing swamp painting. And the Vanuatu Bag of Kava made me hopeful that the people there can recover quickly from the recent PAM devistation. Thanks so much for inviting me to the Black and White Challenge. I am honored. 1. On 5 days, create a post using either a past or recent photo in B&W. 2. Each of the 5 days, invite another blogging friend to join in the fun, which keeps this interactive. I think your approach to the challenge is just fine :-). Best to post when you are inspired! amen to that – because forced posts end up robbing the joy of it all – even though I am planning to the final two quicker rather than later…. just going through some photos now…. 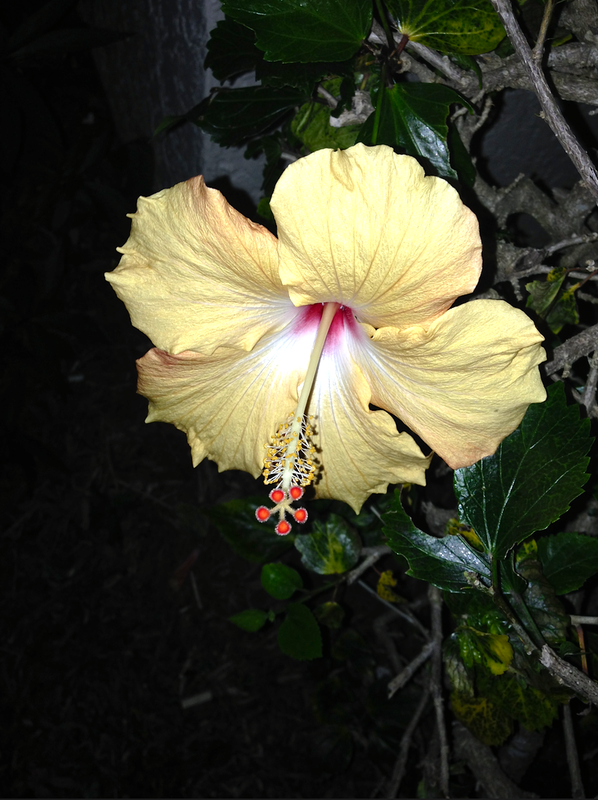 I can’t wait to learn the hibiscus color. 🙂 And I like the retaining wall in the corner of your first image, it grounds the photo and shares more of where you were. Wow what a great variety. That first photo of your view every day is a jaw dropper. The snow photo, minus the doggy prints, is what we had here today. ha 0 that’s funny – and here is a little snippet of the daily view…. Bon jour Mel – ❤ we almost went to the keys this time (we want to visit the Key West Key Lime Pie co. – and group on had some sweet deals for that area for stuff to do– but we went to Tampa instead – but maybe next year) – anyhow u r reine de voyage!!! March 19, 2015 at ..
Yvette, the top photo of the palm trees against the sky, with the clouds might be B&W but it feels so warm, even humid. Had to laugh about the Kava – it’s used a lot in Fiji. I didn’t try it while we were there back in 2012. But it was everywhere, and is quite an intoxicant – in a relaxing way – so I’ve been told. Unfortunately, I think too much of it can be a bad thing – some people get addicted to it. I think the slimy effect would be off putting, for sure. BTW is the hibiscus pink? thanks for guessing Jill – and nope not pink – and seeing that it is the next day I will reveal the answer – it is yellow! March 18, 2015 at ..
March 20, 2015 at .. Sounds like a wonderful trip. I love palm trees, they mean holidays to me, so many thanks for linking them in to the Up Down Challenge. P: I loved all the pictures here. The different shades of Florida, if you will. You capture unseen moments; the unusualness about a place we might otherwise not see. Of all the pictures my favorite is the one you like too. There’s indeed a different feel to it — as though the world has become still in all its motion. Perhaps our interpretations rely on the mood we are in. You were happy that day and so the picture became dear to you – and to me now because I think I am happy. March 28, 2015 at ..